Crews work on the Landing Park wall construction. During closures, all roads are open to pedestrains and bicyclists. For safety, bicyclists are asked to walk their bikes due to the limited space and compromised condition of the roadway. All aspects of the project are expected to be completed before Memorial Day Weekend, the end of May. Note: This look ahead reflects what the contractor currently anticipates. Weather and other circumstances can change construction crew activities, and therefore road and park access. This week the construction crew is grading for traffic curbs and sidewalks, pouring concrete curbing and sidewalk, installing illumination conduit, and working on the concrete seating. A fun milestone, the first sidewalks for the project were poured on Tuesday. Note: This look ahead reflects what the contractor currently anticipates. Weather and other circumstances can change construction crew activities and bridge access. Please visit the website for the most up-to-date information. This week the construction crew is grading for traffic curbs and sidewalks, installing illumination conduit, and pouring sample sections of sidewalk to review color and pattern. Of special note, the Landing Park will be closed Monday, April 8, through Friday, April 19, due to heavy construction activities in the park. Note: This look reflects what the contractor currently anticipates. Weather and other circumstances can change construction crew activities and bridge access. Please visit the website for the most up-to-date information. This week the construction crew is removing existing asphalt where the new sidewalks will be located and installing drainage structures. Note: This look ahead reflects what the contractor anticipates at this time. Weather and other circumstances can change construction crew activities and bridge access. Please visit the website for the most up-to-date information. Next week, work will kick-off for the final phases of the Woodin Avenue Bridge Project. Nearly all aspects of the project are expected to be completed before Memorial Day Weekend, the end of May. This week the crew is finishing up their winter shutdown activities and will be off site before the end of the week. There will be no lanes closures. Construction is expected to restart in March, but the start date is weather dependent. When spring construction resumes, activities will include construction of the Landing Parking retaining wall and handicap ramp, stormwater improvements, sidewalk widening, landscaping, and irrigation. The entire project is anticipated to be completed by the end of May if the weather cooperates. Thank you to everyone for your cooperation this fall. Project updates will resume again in late winter, once the anticipated restart date is known. Bridge closed through thursday, november 8th, at 5 p.m.
Balance of this week (November 6 - 9): The bridge will be closed until Thursday, November 8, at 5 p.m. for repairs to the bridge deck and sidewalk, paving, saw cutting longitudinal joints, and restoration. Next week (November 12 - 16): Complete preparations for winter shutdown. 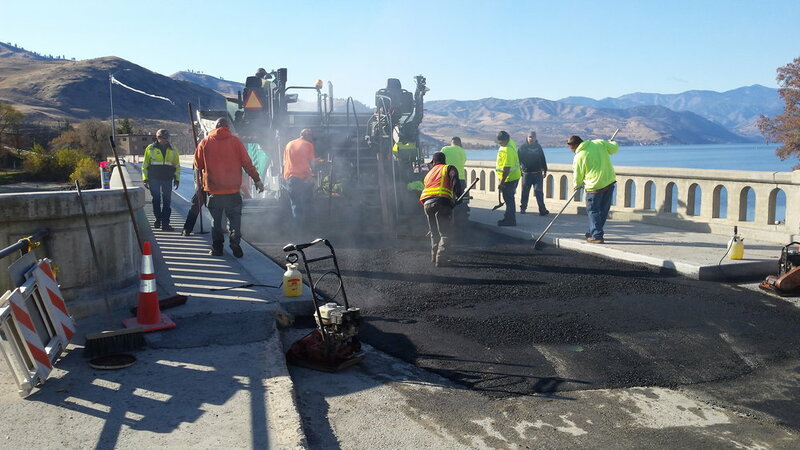 Next week (November 5 - 9): Favorable paving weather has led the contractor to adjust the week's activities. The bridge will be closed from Monday at 7 a.m. until Wednesday at 7 p.m. to pave the bridge and the trench approaching both ends of the bridge. The contractor will also continue repairs under the bridge. November 12 - 16: Complete preparations for winter shutdown, possible temporary lane closures. This week the bridge will remain open the rest of the week. They will be connecting water services and hydrants from the bridge to Columbia Street on the north and from the bridge to Third Street on the south. The contractor will also continue repairs under the bridge. The bridge will remain open today (Thursday) with periodic lane closures to install reinforcing steel for sidewalks, as well as water services and hydrants from the bridge to Columbia Street on the north and from the bridge to Third Street on the south. The bridge will be closed 8 a.m. - 5 p.m. Friday (weather dependent) to pour sidewalks. The contractor will also continue repairs under the bridge. Next week (October 29 - November 2): The bridge will be closed 8.am - 5 p.m. Monday (weather dependent) to pour sidewalks and on Thursday for bridge deck repairs. There will be periodic lane closures Tuesday, Wednesday and Friday. However, the plan is to have no lane closures from 3-5 p.m. on Wednesday, Halloween, so as not to impact trick-or-treating. The contractor will also continue repairs under the bridge. November 5 - 9: This week, possible 8 a.m. - 5 p.m.bridge closures (weather dependent) for bridge deck membrane installation and paving. The contractor will also continue repairs under the bridge. This week the bridge will remain open through the rest of the week with periodic lane closures to install water services and hydrants from the bridge to Columbia Street on the north and from the bridge to Third Street on the south. Next week (October 22-26): The bridge will be closed Thursday and Friday to pour bridge sidewalks. Possible intermittent lane closures Monday, Tuesday, and Wednesday to connect the new water main, install reinforcing steel for the bridge sidewalks, and install the park retaining walls. The contractor will also be starting under the bridge repairs. October 29 - November 2: Possible bridge day time closures for deck repair. The contractor will be installing retaining walls in the park and preparing for paving. This week through Friday at 5 p.m., the bridge will remain closed while the contractor continues installing water main from the bridge to Columbia Street on the north and from the bridge to Third Street on the south. Next week (October 15-19): Possible day time closures for the underground water installation, including new hydrants, branch pipes, and meters, as well as testing of the water main. The contractor will also be installing rebar in the bridge sidewalk for widening, continue upgrading the electrical under the bridge, and starting the park demolition so they can install the retaining wall. October 22 - 26: Possible day time closures for utility work, including connecting the water main to the new hydrants, branch pipes, and meters. Bridge deck repair is also anticipated, along with installation of the retaining walls in the park. The remainder of this week, the bridge will be open with short one lane flagging stops. Next week (October 8-12): The bridge will be closed Monday morning at 7 a.m. through Friday at 5 p.m. The contractor will be installing water main from the bridge to Columbia Street on the north and from the bridge to Third Street on the south. October 15 - 19: Possible day time closures are anticipated to complete the water main installation. The contractor will be testing the water main, installing rebar in the sidewalk on the bridge for widening, upgrading electrical under the bridge, and starting demolition in the park to prepare for the retaining wall. The remainder of this week, the bridge will remain open with short periodic flagging stops. Next week (October 1-5): The bridge will be closed Monday morning at 7 a.m. through Friday at 8 a.m. The contractor will be installing water main from the bridge to Columbia Street on the north and from the bridge to Third Street on the south. Additionally, they will work on the electrical under the bridge and begin pouring lamp poles. October 8 - 12: Day time closures are anticipated to complete the water main installation. The contractor will be testing the water main, installing rebar in the sidewalk on the bridge for widening, and starting demolition in the park to prepare for the retaining wall. The bridge will remain open throughout the rest of the week. Next week (September 24 - 28): The bridge will remain open to vehicles in the one-way configuration with potential short flagging stops while the contractor works under the bridge installing water pipes. October 1 - 5: The bridge will be closed 8 a.m. - 5 p.m. throughout the week as the contractor installs the water line in the lanes prior to and leaving the bridge. Repair work will also begin under the bridge. No work will be done on the park. 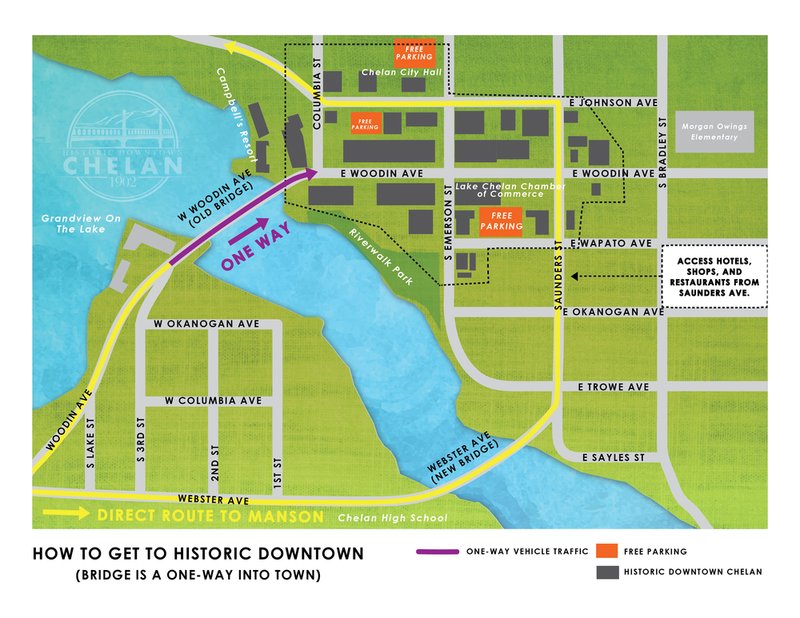 Note: Thank you to the Historic Downtown Chelan Association (HDCA) for the informative map. Crews were drilling holes on Thursday so hangers can be installed for the new water main that will go under the bridge. The bridge has reopened to vehicles and it will remain open through the rest of the week. Thank you Selland Construction! Next week (September 17 - 21): The bridge will remain open to vehicles in the one-way configuration while the contractor works on the opposite half of the bridge. September 24 - 28: The bridge is currently planned to be open to vehicles but may have a single day closure on Thursday (9/27). If the work plan changes due to production, we will update you with new information. Over the next two weeks contractors will begin bridge repair work. 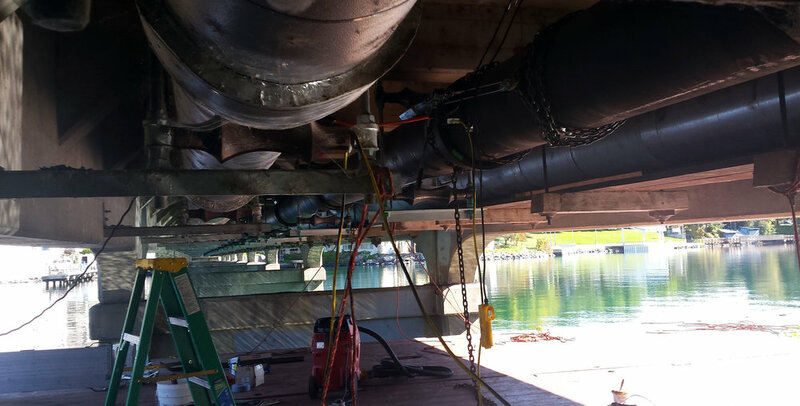 Additionally, a barge will be used to install pipe hangers and 16-inch water main pipes under the bridge. No work will be done on the park. The bridge will be opening to vehicles starting at 5pm on Wednesday, September 12. And, contrary to what was originally anticipated, the bridge will also be open the week of September 17. Starting at 7am Monday, September 10, the bridge will be closed to vehicles and remain closed until 8am Friday, September 14. Traffic will be rerouted as shown on the map. Pedestrian access will remain open during that time. This closure is necessary as the crew starts removing the asphalt from the surface of the bridge. Week’s work will also include mobilizing more equipment and materials, surveying, installing water main pipe supports under the bridge, and removing the existing lamp posts. Similar work will continue the week of September 17, requiring the bridge to be closed to vehicles 7am Monday until 8am Friday, September 21. It will remain open to pedestrians. Park demolition will begin that week as well. During the first week of construction, crews will be mobilizing equipment, surveying, removing a lamp, unloading water main pipe that will span the bridge, and then installing pipe hangers under the bridge. There will be short intermittent delays to bring vehicles and equipment into the area. A couple items will be most noticeable to drivers. The first will be the permanent closure of 3rd street from Okanogan to Woodin Avenue (the steep hill section) which will take place Tuesday afternoon. Also, Woodin Avenue Bridge will be changed to a one-way configuration starting Thursday, September 6. Drivers will only be able to approach the bridge from the west side heading toward downtown. Temporary directional devices will be setup and remain in place until the permanent configuration is completed. A pre-construction project handout has been created and can be found here. It will be distributed multiple places including at City Hall, in utility bills, and through the Historic Downtown Chelan Association, among others. At the preconstruction meeting the contractor Selland Construction and the City discussed the order of work, project communication, utility impacts, and more. Project construction is expected to begin on September 4, pending council review of the schedule, with a winter shut down from approximately Thanksgiving until March, when the project will then resume. Everything is expected to be completed in May 2019. Selland Construction returned the signed contracts and it was executed with all necessary bonding. A pre-construction meeting is scheduled for July 12. After that meeting, the City will work with Selland to select the Notice to Proceed date. It’s looking like construction will begin sometime in late July or August, though that is still tentative. On June 5, the Chelan City Council voted 4-1 to award the contract to Selland Construction, accepting their $3,159, 528 bid. Once the Council authorizes the mayor to finalize and execute the contract, it will be forwarded to Selland for signature. They will have two weeks to return the signed documents. After the documents are returned and executed, the City will work with Selland on the best time to issue the Notice to Proceed (NTP). Selland will have 105 working days to complete the project from the NTP date. 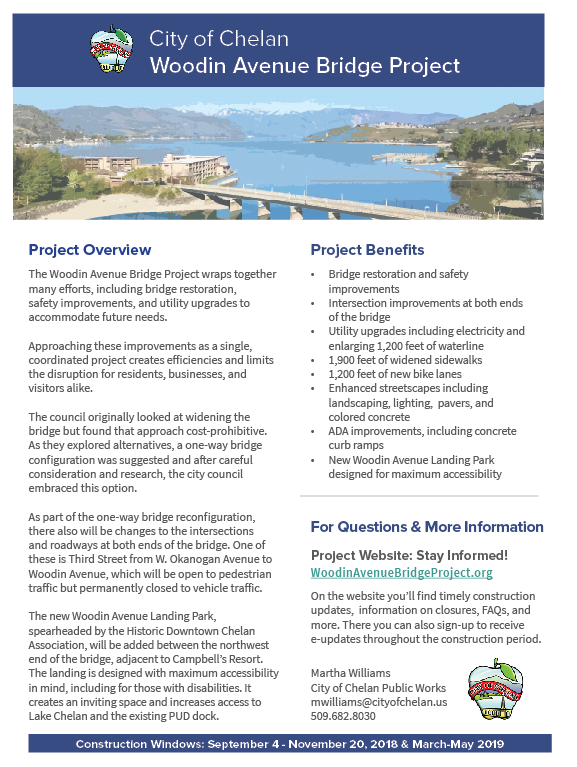 On Tuesday, June 5, the City Council voted to move forward on the project after receiving approval from the WSDOT Local Programs to proceed. At that meeting the Council reviewed the sole bid received from Selland Construction of Wenatchee for $3,159,528. The City also needs authorization from the State Transportation Improvement Board, another funding sources.